Audi Q3 Performance, Engine, Ride, Handling | What Car? 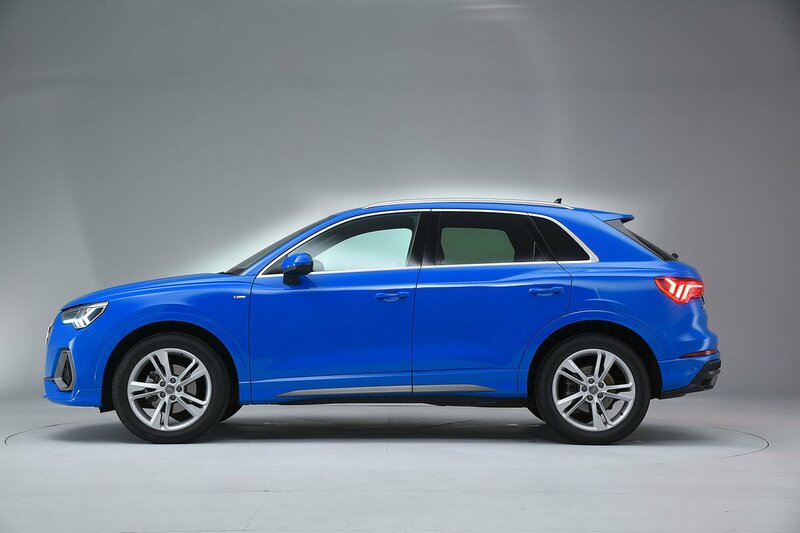 The petrol Q3 range kicks off with a front-wheel-drive 1.5-litre turbocharged engine, badged as the 35 TFSI. 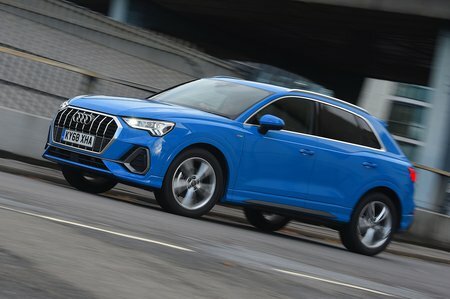 Its on-paper performance (0-62mph takes 9.2sec) is decent and it has more than enough power for town driving, but faster roads often force the optional, often dim witted, seven-speed dual-clutch automatic gearbox to shuffle down through the gears to keep the Q3 motoring forwards with any verve; we have yet to test the standard fit six speed manual but suspect drivers will find it less frustrating. Despite these quibbles, we still recommend the 1.5 over the larger 2.0-litre petrols. Badged 40 and 45 TFSI, both are exclusively available with quattro four-wheel drive, to the detriment of fuel economy. Their extra power doesn't really make things more relaxing, either; both engines need plenty of revs before their extra power is noticeable, and their mandatory automatic gearbox seems even more prone to lag. 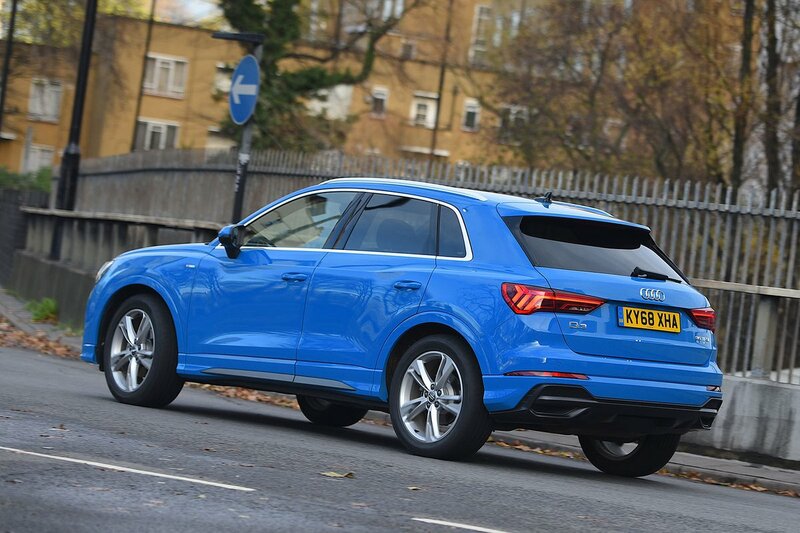 The 148bhp 2.0-litre diesel engine (named 35TDI), by contrast, feels perfectly suited to the family-sized Q3. It pulls strongly from less than 2000rpm and feels far more comfortable lugging around people and luggage. Granted, with only 148bhp to call upon, it can feel a little flat when overtaking on faster roads but offers the best compromise between pace and efficiency in the range. It’s available with front-wheel drive and a manual gearbox, or quattro four-wheel drive and an automatic. There are three suspension options to choose from. Entry-level Sport-spec cars get standard steel springs, while S line models get a stiffened, lowered version of the same setup. Of the standard setups, we’ve only tried the stiffer S line version. It’s supple enough over large bumps such as speed bumps, but the Q3 feels firmer than the Volvo XC40’s equivalent R-Design setup. It tends to thump over sharper-edged potholes and fidget over pimply surfaces. Optional, or standard with Vorsprung trim, adaptive dampers are worth considering; they smooth things out extremely well and help to control body movements over dips and crests. A high ride height never does much to help a car’s handling but, compared to rival SUVs, the Q3 conceals its tall stature better than most. Body lean is well controlled, especially if you specify the optional adaptive dampers, and there’s lots of grip spread evenly between the front and rear axles. All in all, the Q3 feels a lot more agile than the Volvo XC40 and more predictable than the BMW X1. S line models have larger alloy wheels than entry-level Sport trim cars, contributing to even higher levels of grip. All Q3s have helpfully progressive steering that gets faster the more you turn the wheel. This happens gradually, so placing the car accurately on the road is easy and it makes for less arm twirling in tight turns. The 2.0-litre petrol engine is the smoother petrol option; the 1.5-litre seems noisier in the Q3 than in other VW Group cars that it also appears in, being rather gruff even at idle and when you're accelerating gently. Meanwhile, the diesel is noisier than any of the petrols when revved, but is generally quite subdued compared with equivalents in the likes of the BMW X1, Mercedes GLA and Volvo XC40. The 2.0-litre cars (40 TFSI and 45 TFSI) come as standard with a seven-speed dual-clutch automatic gearbox that is very smooth when changing through the gears and responds quickly in manual mode. Automatic mode is smooth, too, but its frequent hesitance can be annoying. Thankfully, road noise is well suppressed for a car with large wheels standard on most models and wind noise is limited to minor buffeting around the door mirrors. However, the XC40 provides a still calmer travelling environment at motorway speeds.